Once the busy summer season of rock pooling events is over, we like to jump on the ferry and get away for a few weeks. We have friends to visit and lots to do, but somehow we always end up on the beach. It’s fascinating to discover the difference it makes to be a few hundred kilometres further south. Although there are plenty of familiar species here, there are some that are around their northern limit here in Brittany, but might put in appearance in Cornwall one day, especially as the seas warm up. On a sheltered shore in the lee of the Quiberon peninsula, the beach where our friend Mylene spent her childhood holidays, I find a Pachygrapsus marmoratus crab, a species I saw nearby last year when I didn’t have my camera. The rippled pattern on its carapace and the wide flat edge between its eyes make it unlike any of our native crabs. Originally found further south on the Atlantic coast, it has been working its way northwards in recent years and seems to be firmly established in Brittany now. Something I didn’t notice last year is how fabulously green its knee joints are, matching its emerald eyes. It’s not afraid to use those leg-joints, scuttling away at high speed at every opportunity to hide among the dense aggregations of the invasive Pacific oyster. I nearly lose it several times before it decides to settle in the corner of a pool, allowing me photograph those hairy legs and green knees. The wonderful green knees of Pachygrapsus marmoratus! Junior calls out that he’s found a slug. He thinks. He’s not sure. There are so many living blobs on the shore that it can be hard to tell. The blob is a plump yellow thing, perhaps four or five centimetres long and from the speed it’s crawling across the rock, it is most definitely a slug. Initially, I assume it’s a sea lemon, but it doesn’t quite look right. It has a more squidgy, unicoloured look and instead of the citrussy bumps of the sea lemon’s skin, this slug has rounded protrusions of varying sizes all over its back. I can’t place it so we call it a ‘Doris might be a sea lemon, species’ and I take plenty of photos to help identify it for sure later. It’s over a month after we return from holiday that I remember the photos and transfer them to my computer. On screen it’s obvious that this Doris slug looks nothing like any sea lemon I’ve ever seen. With the help of some extremely geeky books, websites and a forum of fellow nudibranch aficionados, I manage to confirm that it is a Doris verrucosa. The “warty Doris”… not the most charming name, but Junior is rightly thrilled that he found it. This isn’t a species we’ve ever seen in the UK. Each rhinophore on the slug’s head is framed by two pairs of prominent protrusions and the gills are framed by a crown of tall protrusions. We revisit a beach that is the polar opposite of the sheltered shore of Quiberon. Ste Anne de Palud is a west-facing windswept expanse of muddy sand framed by a north-facing rocky headland and pools, which provide an incredible habitat for all sorts of clam shells and colourful anemones as well as a perfect set of conditions for the honeycomb reef worm, which builds its huge beehive-like structures all around the rocks. The anemones are fabulous, but so well tucked under steep overhangs of rock or so well buried in sediment that they are tricky to see, let alone identify. Junior is digging holes in the sand and discovers just how packed with life the sand is as he uncovers dozens of thin tellin shells, which burrow their way back down as he watches. The tideline is strewn with evidence of the diversity of life beneath our feet, with spiny cockles, sea potato urchins, the delicate tubes of the worm Pectinaria belgica and necklace shells. There’s a good chance that some of the less familiar animals we’ve seen will show up on the Cornish coast at some point. The St Piran’s hermit crab has already successfully made the crossing and I saw them first here. A trip to Brittany feels like the perfect way to familiarise myself with creatures that I might need to identify in future. It’s also a good excuse to eat lots of pancakes and put my feet up. Both make me happy! You never know what you’ll find on a beach and it’s rarely what you’re looking for. It felt like something of a fluke when an octopus put in an appearance on my mollusc course in Devon last month. 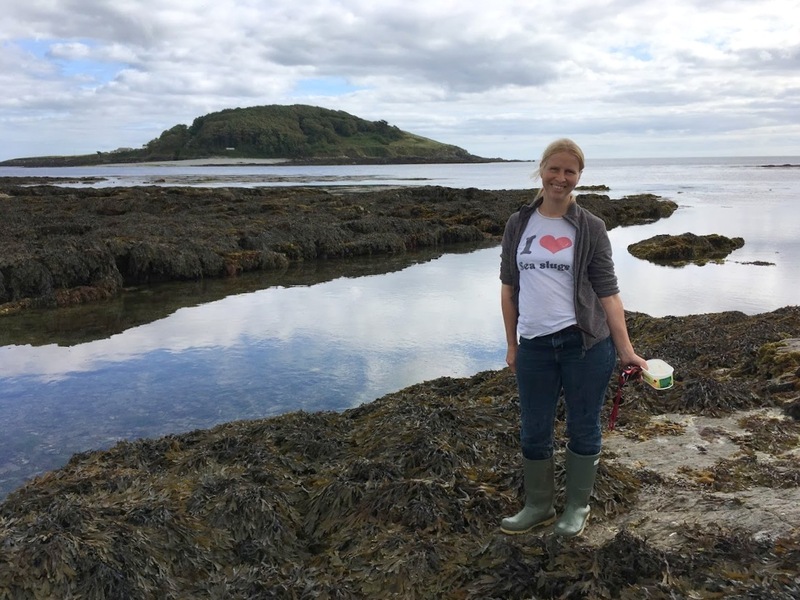 I could only hope that some interesting snails and perhaps a slug or two would turn up for this week’s molluscs workshop in Falmouth for the Environmental Records Centre for Cornwall and the Isles of Scilly (ERCCIS). The sun shone, which is always a good start, and I couldn’t have asked for a more enthusiastic group. After the morning’s presentation and a lot of work on topshell identification, we enjoyed a perfect picnic on Gyllingvase beach, taking care to protect our sandwiches from the herring gulls, before setting out to explore the rocks. I was showing some of the group the different topshells, winkles and other shells found near the top of the shore, when someone found a coil of eggs under a stone. It was a perfect start – the eggs of a great grey sea slug (Aeolidia filomenae). We looked all around the area and couldn’t see the slug that had laid them, but it was probably still close by. Great grey sea slug eggs – from another day because I didn’t take a photo of ones we saw at Falmouth. Inspired by our early success, we carried on down the shore and one of the group found some codium seaweed. Remembering that I’d mentioned that the photosynthesising sea slug, Elysia viridis, is often found on this seaweed, she called me over. The lump on the codium she’d hoped might be a slug was seaweed, but we examined the codium some more and soon found two photosynthesising slugs on it. The shout of, ‘Slug’, went up so that everyone could gather to take a look. Elysia viridis, the photosynthesising sea slug. This slug retains the chloroplasts from the seaweeds it eats and they carry on producing energy inside its body. Gyllingvase has all sorts of seaweeds, lots of pools and steep rocky overhangs, which makes it a perfect habitat for snails. We found the egg capsules of the netted dog whelk and the European sting winkle among many other things. ‘Slug!’ The shout went up again, this time for a big brown sea hare (Aplysia punctata) and before long we’d seen several of them. They love the sea lettuce and other seaweeds that are growing rapidly in the pools this time of year. They were congregating all over the beach to lay their pink spaghetti egg strings on the seaweed. We had another shout, that turned out to be this beautiful candy-striped flatworm. It’s not a mollusc of course, but was still a great find. It was clear there were plenty of creatures to be found and the entire group took the search seriously, crawling on the rocks, staring into pools, lifting seaweed and bringing all sorts of finds to me. 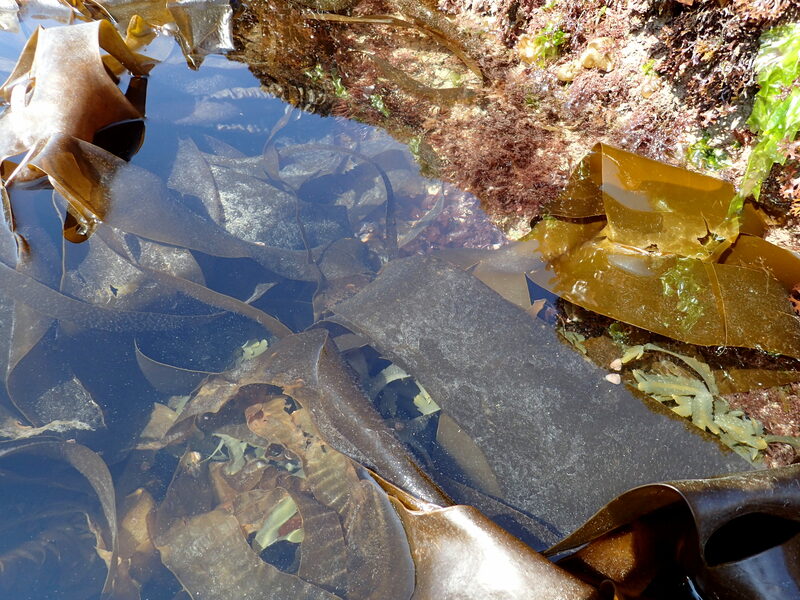 In a kelp-strewn gully at the edge of the sea, we found more snail eggs of various sorts and some live sting winkles. A sea lemon was sheltering in a small hole in the rock, our fourth sea slug species of the day. The sea lemon, showing its feathery gills (top) and the rhinophores on its head (bottom). We put it in a pot of water to watch its rhinophores emerge from its head and its gill feathers unfurl on its back. By now the tide was starting to turn, so I placed the sea lemon back on its rock and hurried to take a look down another promising gully. There were some anemones about, the favourite food of the great grey sea slug whose eggs we’d seen at the beginning, so I hoped I might find one hanging about there somewhere. After a few minutes of examining an overhang and taking a look under stones I’d drawn a blank and stopped to take a look at some finds people had brought to me. I was about to haul myself back up the rocks when I spotted a long stone that was half-wedged against the rounded overhang at the back of the pool. It looked like a sluggy sort of stone, one that wouldn’t move easily and might have all sorts of sponges, squirts and other things slugs like to eat growing on or near it. As soon as I turned the stone, I could see the colourful cerrata of a little slug. It most definitely wasn’t a great grey sea slug with its bright reds and blues. I screamed, ‘Slug!’ loudly enough for most of Falmouth to hear and fumbled with a petri dish, scared I might drop the slug in the water and lose it. The great thing about teaching a workshop is that everyone there is just as excited by marine creatures as me, and this one, a Facelina auriculata, is one of the most beautiful slugs I’ve seen on the shore. It caused a lot of excitement and photo taking. After returning the Facelina auriculata, which we nicknamed ‘the patriotic slug’ due to its red, white and blue colours, I turned my attention to a deep pool to look at some rainbow wrack. Lovely though the turquoise iridescence of rainbow wrack is, it wasn’t the seaweed itself that interested me, but the colony of various hydroids growing on it. These colonial animals are relatives of the jellyfish and anemones and are a favourite food of many sea slugs. I was hoping to find a Eubranchus farrani, a colourful slug with fat cerrata and orange markings on its body, which loves to eat hydroids. I soon spotted a tiny slug, but it was something different. It was so small I could barely see it, but in the petri dish when it came out fully I could see under my camera’s magnification that it was a Polycera quadrilineata, a pretty white slug with yellow markings and yellow-tipped tentacles. It was hard to see much with the naked eye, but we all had hand lenses and cameras to get a close look. By this time the tide was rushing in. A last foray along a higher gully produced a cowrie shell and a perfectly orange common starfish, which isn’t a mollusc but made us happy nonetheless. By the end of the day we’d seen five species of sea slug, the egg spiral of the great grey sea slug and all sorts of snails. It was the kind of fantastic result that comes from lots of dedicated people searching and a good dose of luck. I can only hope that my run of workshop luck holds for my jellyfish course later in the year. Who knows what might turn up? Even my family look at me strangely when I suggest rock pooling in this weather. The Met Office reckons it’s going to turn out fine, but the wind is flinging water straight into our faces and the beach is deserted. We huddle down on some damp rocks and rush to eat our pasties before the rain turns the pastry soggy. “I wonder if people realise what you go through to put pretty pictures on your blog?” Other Half says. I nod, watching the waves crashing onto the shore and thinking that it’s worse than that. In these conditions I’m unlikely to find much, let alone manage pretty pictures. After a quarter of an hour of staring into holes in the rock, taking lots of rain-blurred photos and a few passable ones of common crab and barnacles species, I’ve established that my waterproofs are anything but waterproof. If it’s possible, the rain is getting heavier. Cornish Rock Pools Junior and his dad have wandered off and are probably reaching their tolerance limit. I find a stalked jellyfish and think that’s likely to be the most exciting find of the day. I lift the edge of one last stone. There are some thick yellow sponges and the rock is crusted over with bryozoans. Broad-clawed porcelain crabs are scuttling along and there are little banded chink shells. On the far side is a spot, maybe half a centimetre across. It’s hard to make it out, but it has a blue-ish tinge and a lined appearance, like an anemone out of the water. I think it’s a sea slug, but it’s far too delicate to pick off the rock and even if I do there’s nowhere to put it. I need to see it in water otherwise it’s just a blob of jelly. There’s no chance of that here at the base of the gully where the waves are pounding in, so I heave the boulder up the shore and lower the side with the slug into the nearest pool. Facelina auriculata sea slug unfurls its tentacles and cerata in the water. Shelter’s hard to come by. The surface of the pool distorts with every gust of wind and the rain goes up the back of my coat and into my ears as I lean over to hold the rock in position. Straight away, I know this is definitely a sea slug. In the water, its cerata pop up all over its back and long tentacles and rhinophores unfurl around its head. This is the sort of colourful, beautiful slug that I’m always hoping to find and only rarely do. Under the camera it has striking red lines and markings up its cerata, white stripes down its head and an iridescent blue sheen that changes as it moves. This is a new slug to me and I can’t wait to look it up when I get home to check the exact species. In the meantime, I take as many photos as I can before hauling the rock back to the same spot where I found it. That done, I rush up the beach to tell my Other Half, Cornish Rock Pools Junior and everyone else I see that day about how amazing my sea slug was. Facelina auriculata sea slug – from different angles the colours seem to change. Thanks to my pile of identification books and the quick responses of the hugely knowledgeable members of the NE Atlantic Nudibranchs forum on Facebook, I soon have it confirmed as Facelina auriculata (previously known as Facelina coronata). This slug is found around many coasts of the UK, and is meant to feed on hydroids, although I didn’t see many in the vicinity of this one. I’m very lucky to find it intertidally on such an average tide. If you think rock pooling isn’t a normal sort of thing to do in January, I can understand that. You’re probably right and I think my family would agree with you, but you never know what’s going to turn up next in the Cornish Rock Pools. Sometimes it’s worth braving the horizontal rain just in case. See – it’s lovely out there! Looe rock pooling in January. A Xantho pilipes crab – they vary in colour but always have hairy back legs. I love sea slugs a bit more than is probably usual. My other half even made sure I have the t-shirt, which I wear with pride in the Cornish rock pools despite the odd looks it gets me. Trend setting in my waterlogged wellies and ‘I love sea slugs’ t-shirt. Hannafore beach, Looe. If you don’t already have your own t-shirt, it might be that you haven’t yet met these amazing little creatures. Unlike land slugs, sea slugs come in a mind-boggling variety of colours and shapes and have cool super-powers. If you’ve ever been rockpooling, you’ll know the feeling: you’re in the zone, bottom high, head down, lifting a rock or staring into the water when a movement catches your eye. While you’re registering that it’s some interesting creature you’ve never found before, said creature is darting away under an overhang or boulder never to be seen again. My camera is full of “things that were there only a millisecond before”. Not the most accomplished photo of a Greater pipefish as long as my arm! If you read this blog regularly, you’ve probably noticed a pattern: I bimble about the Cornish rock pools looking for an exciting creature, fail completely, then find something unexpected. Well, hopefully you like the format because this week is no exception. I go on a quest to find fish eggs and discover this rare sea slug.